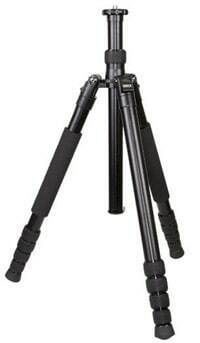 There are actually a number of good quality tripods under $200 that will last you for many years. I've always made it a mission of mine to find the best and least expensive camera gear for my readers, so I set out on a mission to find the best tripod under $200. But there's a question you have to answer first: Do you need the tripod AND the head under $200, or just the tripod itself? Professional tripods come in two pieces: (1) The tripod legs and a flat top with a bolt coming out (which you can't connect directly to the camera), and (2) a piece that attaches on top of the tripod legs that attaches to your camera and allows you to change the angle. In this post, I'm going to do my very best to recommend legs and head under $200, but a few of them might go very slightly over your budget since we're getting both pieces. But whatever you do, PLEASE don't cheap out on your tripod. If you buy one of the cheap Dolica tripods on Amazon, I promise you'll be back on this page in six months ready to buy another tripod. Those things are trash! I've owned a number of Vanguards over the last few years and every time I get one, I'm surprised with the high quality for a very reasonable price. Compared to what I see from other tripod manufacturers at the same price, the Vanguard is the clear winner in my opinion. The #1 thing I like about this tripod is that it comes with a good quality ballhead. The ballhead is usually the first thing to break on a cheap tripod, so having a good one means your purchase will last much longer. The ballhead is easy to set, locks down tight, and has nice big knobs for quick adjustments. It's a compact head, so I wouldn't recommend it if you're using a professional sports or wildlife lens like a 600mm f/4 on a 1DX, but if you are shooting an average DSLR or mirrorless camera, this is the best choice out there as far as I'm concerned. I also like that Vanguard didn't cheap out on the little things on this tripod. It includes bubble levels on the head, a higher quality aluminum on the legs, beefy leg locks, and retractable spikes. The legs can be adjusted to three different angles (25, 50, and 80 degrees), and there are only two leg extensions, which makes setup very fast. Given the center column, you normally can't get your tripod very low to the ground when you want an extreme perspective for a landscape, or for photographing flowers. However, this tripod allows you to flip the center column so that you can get right down to the ground. That's a pretty neat feature when you're in a pinch. There are really only two drawbacks to this setup. First, the ballhead is not Arca Swiss compatible. It's not a huge deal, but it means that if you ever decide to get a higher-end ballhead, you'll have to pick up a couple more quick release plates for $10. The second drawback is that the tripod doesn't get high enough for an average height man unless you extend the center column. On some tripods that's a bigger deal because the center column is often wobbly, but the Vanguard is built so well that it's not that big of a deal. The tripod itself gets to 5′ 4″, and then you add the ballhead and camera on top of that and it'll be a very comfortable height for anyone other than Michael Jordan. Price: Check the current price on Amazon. This is a match made in heaven as long as you don't mind the weight of the rig. Warning! It's heavy and not compact. But it's military grade in terms of durability and stability. This is the combo that I've been recommending for years, but there are two problems: (1) It's heavy, and (2) Induro discontinued this tripod, so you may or may not find it in stock anymore. 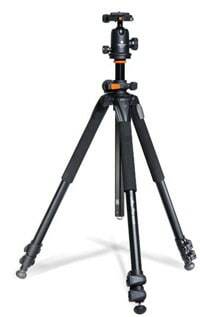 You also get a nice ballhead with this tripod setup (the same one as the Vanguard that's my top pick). That makes adjusting the camera really quick and easy. Before you read any further, you should know that this combo will put you over your budget just slightly. I actually like this tripod quite a bit, but it has one flaw that really bothers me: the standing leg angle is a little too narrow, so it's prone to being blown in the wind. It's made very sturdy, but since the legs don't extend out quite at the wide angle that they do on most tripods, you can have some stability problems. Would I choose this over the Vanguard? Probably not because of the tight leg angles. The Manfrotto BeFree tripod is very similar to the Mefoto, but it's even shorter, which makes it useless for for most photographers of an average height. So unless you're using your camera for a belly button selfie… not the greatest choice. It's a shame, because the tripod comes with a decent ballhead and has really high quality leg locks, but it's not usable at this height. The one use case where this would be a good choice is if you're hiking and want to put this in a very lightweight backpack. You'll have to kneel down or hunch down to take photos, but that's not too big of a deal when you're out hiking and just need something lightweight and compact. But as a daily driver tripod for serious photographers, this is not something I'd recommend. When I go out to do workshops around the world with readers of Improve Photography, this is by far the most popular tripod I see. It's a great choice if you have a particularly lightweight setup like a Micro 4/3 camera or a Fuji with a small lens, but it's just not quite beefy enough for anything more than that. If there is anything more than a slight breeze, your camera will not stay steady enough to get a long exposure shot. The benefit of these little Mefoto tripods is that they are very lightweight and compact. They are great for travel photography for that reason. However, I'd have a tough time recommending them for serious landscape work. Whenever I look down the line of photographers at my workshop and see 1/3 of the photographers using these tripods, I always think to myself what a shame it is that they didn't get the Vanguard instead. In fact, that's exactly what drove me to write this article in the first place. The MeFoto has some pretty cool features, like being able to unscrew one of the legs of the tripod to use as a monopod. That's cool! Check the height of the tripod and make sure it's tall enough for you. Remember that the tripod doesn't have to be as tall as you are, but needs to bring the camera to eye height. I'm 5'10”, so I really only need a tripod that is 4′ 8″, because the ballhead brings it up another 6″ and then the camera brings it up another inch to where the LCD is. Also, the camera only needs to come to the height of my eye, not the top of my head. COMPLETELY IGNORE the advertised “Max load capacity” of the tripods when you're purchasing. There is no standard way to test for this, so the tripod manufacturers just use it as a marketing ploy. The only way to know how sturdy a tripod is, is to test it! Stick with the well-known brands. There is SOO much crap in the tripod market. Most of the tripods I see are trash, so you really have to shop around to get something high quality. I've tested hundreds of different tripods from different manufacturers (some in-depth and some just playing with them at conferences), and there are few tripods that I'm really happy with. It's worth the hassle to find the right one. The maximum height of the tripod is important, but don't ignore the minimum height of the tripod. I find that I'm often shooting barely up off the ground when I'm photographing landscapes and flowers. If your center column doesn't flip and is too long, it can limit the perspective you can get. Keep in mind the number of leg extensions on the tripod. 3 leg locks is probably my preference. If you get a tripod with 4, then it takes that much longer to set up the tripod each time, but two leg extensions means the tripod is not as compact. Buy right, and buy ONCE! I bought 6 or 7 tripods before I finally bit the bullet and purchased my Feisol CT3442 (click to read my full review) and Really Right Stuff BH40 Ballhead. It was really expensive, but as a professional photographer who travels around the world holding workshops, it's cheaper to buy a good quality tripod once, rather than buying and breaking cheaper stuff. The tripods on this list keep your budget in mind, but will last you a long time. They are the best budget tripods out there. When I conduct landscape photography workshops, the first thing I notice is the expensive equipment that many of the participants have. Brand spanking new 5D Mark IIs, 70-200mm lenses, etc. It amazes me how many photographers buy so much gear before they finally listen to the oft repeated but seldom followed advice to buy a professional tripod and a decent ballhead. If you shoot landscape, night, or macro photography, do not buy another piece of photography gear until you buy a solid tripod. There is a reason why you hear every professional photographer on planet earth repeat this advice: it actually affects the image, unlike buying a fancy new lens which still won’t give you sharp photos because it’s handheld or on a junky tripod. The $150 tripod you bought from Best Buy (or wherever else) is not a professional tripod. I have tested them all, and they simply don’t deliver. So what tripod should you buy that won’t break the bank? Here are some things to look for. Sorry, don’t mean to be a brand snob, but there are only a few brands that do this right. 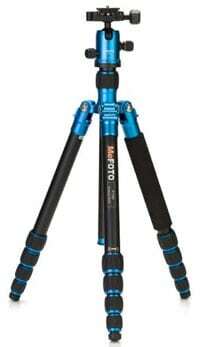 My personal favorite tripod brand is Induro. It’s a lesser known brand, but they have terrific products at competitive prices. You can also trust Gitzo and Really Right stuff, but you have to be made of money to afford a decent one. If you’re on a budget, I would choose Induro first and Manfrotto second. 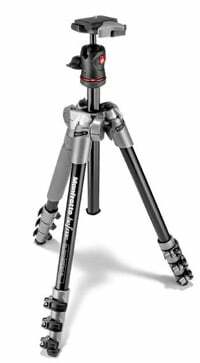 Manfrotto is actually owned by the same parent company as Gitzo, but the tripods are quite different. Manfrotto is a hit and miss kind of company. They have great stuff and they have some real junk. This is one of the most forgotten aspects of purchasing a tripod. I like a tripod that can reach 10″ taller than I am. This helps me when I want to shoot from a creative high angle, and is also handy when shooting on a slope where your tripod is under you. Most people skip this one, but I recommend you take a serious look at the height before buying. For me, the taller the better. There are two types: snap lock and twist lock. It’s really personal preference, but if you shoot wildlife at all, you’ll want twist lock. Nothing worse than finally getting close to an animal only to scare it away with SNAP SNAP! I prefer twist locks. Carbon fiber and aluminum are the most common types. Carbon fiber is light and rigid and expensive. Aluminum is heavy and bulky and cheap. A third option which has recently entered the market is basalt. Basalt fits somewhere between carbon fiber and aluminum since it’s cheap but fairly light. If you can find a good basalt tripod, you’re in good shape. Don’t underestimate just how heavy these things can be. It is a serious pain to lug a tripod on long walks. Buy one that you’ll actually carry around with you. Tripod manufacturers advertise how much a tripod can carry and still hold steady. Here’s a general rule. Take whatever number they give you, divide it by 3, and you have an accurate number. If you have a camera/lens combination which weighs 7 pounds, then you should get a tripod which advertises the capability of holding up to 21lbs. Sorry for you kilo people. I have no idea what that means to you. Seriously. It has to be black. Do you want to look ridiculous being the one dude with a silver/gold tripod? I think not. It’s like wearing flannel… ya just don’t do it.